1 High performance Japanese technology. The brand of water heaters not only come in a range of their own branded models but they also manufacture their product for other companies across the world who then badge the product with their own name. The various styles of water heaters such as continuous flow, heat pump, diesel and solar systems are manufactured from there plant in Japan. Although not as popular in Australia currently the product is slowly finding its way into the market place across South Australia. What is more commonly found now is the continuous flow range of water heaters. The 26 and 20 litre externally mounted models are what you might find installed on some homes and business. The indoor model from the Chofu range of continuous flow units is also be a popular choice for homes with limited space externally (this must be flued to atmosphere and cannot be in sealed room). Like many other types of instant hot water services on the market these also come ready to take multiple controllers so the temperature of the water can be adjusted throughout the property where they are installed. The benefits of having a controller/s installed is that firstly you can have the desired temperature of the water dialled up so that you are not wasting gas by heating the water to a temperature above what you require and if there is ever a fault the controllers will accurately display a code which allows our service technicians to quickly fix your water heater. In most cases if our clients report the error code to us we can have the correct part bought to site or even flown in from Japan via air bag over night (a service no one else offers in Adelaide). The research and development which has gone into the design of the Chofu hot water services allows for a low energy bill but at the same time providing unlimited hot water. The solar systems can be optioned with 3 different stainless steel tanks sizes (colour coded to suit your roof) which can be roof mounted ad there are another 2 options for larger capacities where the tank itself can be floor mounted and the water is then circulated up through the panels on the roof. With the floor mounted option the boost option during cooler months can then be electrical or gas fired. With the gas option, you are creating a highly energy efficient method of heating water, this is for 7 months of the year in South Australia we can rely on the sun’s rays to provide the energy source for the hot water and during the remaining 5 the gas boost will top up the temperatures to avoid any bacteria breading inside of the tank. 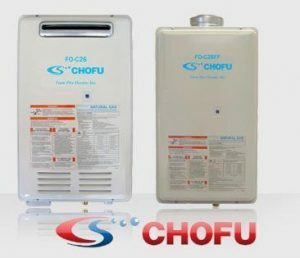 Chofu also manufacture a Diesel oil fired style of hot water service for situations where gas may not be available and where the climate is consistently cold. These systems are not currently being used here in Australia. Currently across Australia there is a very small number of technicians familiar with this brand and how to fault find and work on these heaters. If you are experiencing difficulties with your Chofu water heating systems please feel comfortable in contacting us today and booking an appointment to get your hot water doing what it ought to!